The Dean's Award for Excellence in Research is presented to a senior researcher within Monash IT, in recognition of their sustained and outstanding contribution to the faculty's research. 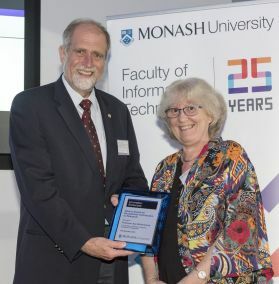 In recognition of 25 years of research excellence and leadership within the Faculty of IT a special award was presented to Professor Sue McKemmish. Sue is Australia's foremost researcher in archival science. She is a Laureate of the Australian Society of Archivists and has helped to reshape the way society deals with evidence and memory. She is best known for her seminal research on personal record-keeping and social memory, especially the way record-keeping addresses social justice, human rights, social inclusion, and the needs of disadvantaged communities. Visit our faculty news service to see how our researchers are being recognised locally and internationally.